Designed, engineered and manufactured by Zion Judaica Ltd, for wholesale please contact us. A Menorah built to last! For indoor and outdoor use. 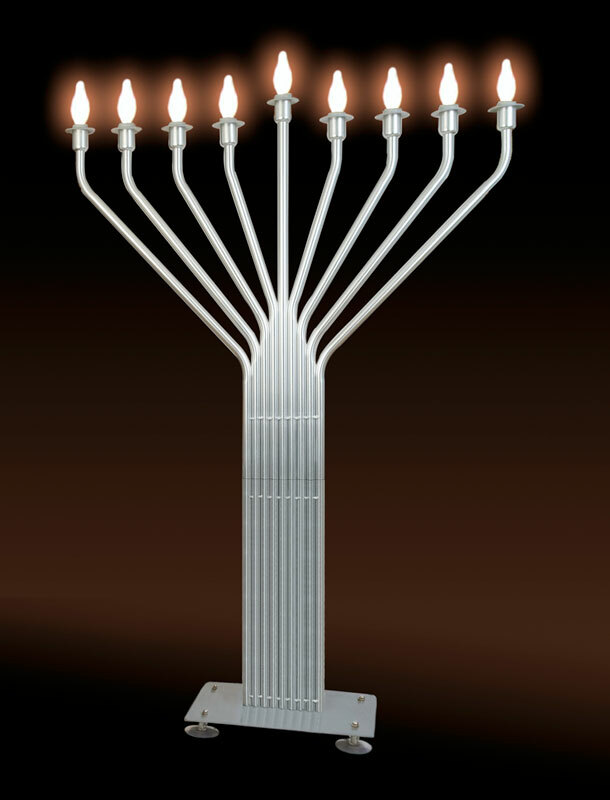 This Menorah has it all, beauty, simplicity, durability. All metal structure. Stands beautiful 6 ½’ feet tall. Ready to use in minutes. Just 3 screws and its ready to go, (tool included). Stunning LED (6 Watt) Chimney style bulbs (included) to simulate real flames. Spare bulbs are available, see the item options. NEW! Optional "in-ground" base for outdoor in soil installations. See item options. American engineered electrical programming, simple "single button" setting which will make the next flame go on every evening at the same time. Order by 3pm and it ships same day.